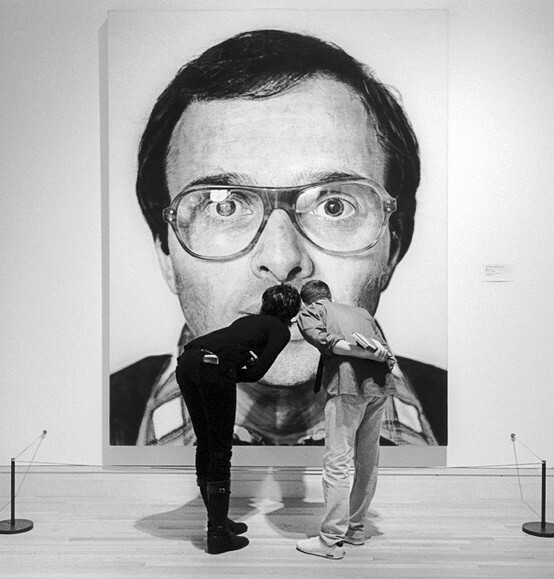 Chuck Close, you make my heart skip a beat. Happy Monday, Lovelies! I saw this gorgeous image make its rounds on Pinterest this past week, and it made me squeal. Anyone else with me? It's just the sort of photo that gets the creative juices flowing. It's just what I needed after a few weeks with my family and Flyboy's return. You see, I found myself feeling a bit uninspired in the bloggie realm. It's been such a fun and eventful month, but it's time that I buckle down, refocus, and get back to ye ol' routine. Flyboy will return to work tomorrow, and the dogs and I will retreat to the office. It's going to get intense. I will probably stay in my pajamas until noon, and remnants from the morning's oatmeal breakfast will harden and stick to the sides of my latte bowl. Glamorous doesn't even begin to describe the blog brainstorming sessions that happen on Lil Puna. Needless to say, that bowl will have to soak for a good two hours, but I will hopefully have a notebook filled with ideas. The game plan? I'll turn to my trusty creative sources -- favorite blogs, images, and artwork for inspiration. I often get fixated on a clever quote or a delightful image and my pen can't quite keep up with the slew of thoughts skipping around in my mind. That's right, images and ideas don't run through my noggin, they skip. I am NOT a runner; I believe a silly number like 26.2 is for the birds. So cheers to a brainstorming sesh filled with skipping! Is there anything you'd like to see posted on One Fine Day? Topics? Trends? Would you be interested in guest blogging? It's always refreshing to hear from someone else. Don't be shy. Leave a comment and let me know what you'd like to see featured here. I already love what you do here. You could consider how-tos, guest blogs, interviews, and maybe, like, spotlights on particular brands or topics. I love your blog as is. I really enjoy your love lists, etsy finds, and stationary roundups. I also enjoy your posts on art and artists. I like Tommy's ideas of how-to's or spotlights on brands/topics. Also maybe a house tour? You seem like you would have the most adorable house! Thanks for the feedback! I definitely plan on a few tutorials, more recipes, some bloggie interviews, and a house tour. Such great ideas!! !